As a brand we are extremely lucky in that we do not struggle for stunning photography of our cars and this shot of the New V8 Vantage sits really nicely as our main aperture image, I imagine other brands will be hard pressed to find something appropriate. So it looks great and with extra coverage / interactions on our page from the Geneva Motor Show it’s been quite an active first week – we’ve received some nice comments which is always appreciated. Alongside the new presentation of the page there are also some functionality improvements that will enhance the ‘brand’ experience, the We Are Social blog gives a good summary. I think messaging between page and fans is long overdue and for FMCG / service sector brands will prove invaluable to helping manage and solve customer complaints. We do get a few of these but it’s obviously quite rare. In addition the improved insights panel and real-time stats is excellent, combine this with the ability to see rolling seven day likes on competitor pages and this will be great for weekly reporting and to see spikes in sector / brand interaction. All of that said, my favourite element is presentational in that the timeline is designed to work all the way back to ‘foundation’, and the UI works extremely well in managing this volume of posts. A historic, milestone based timeline certainly something we will be creating in the coming months ahead of Aston Martin’s centenary next year. Despite my general praise, one of the most disappointing elements of the new design for me is how Timeline decreases the visibility of fan interaction and wall posting. 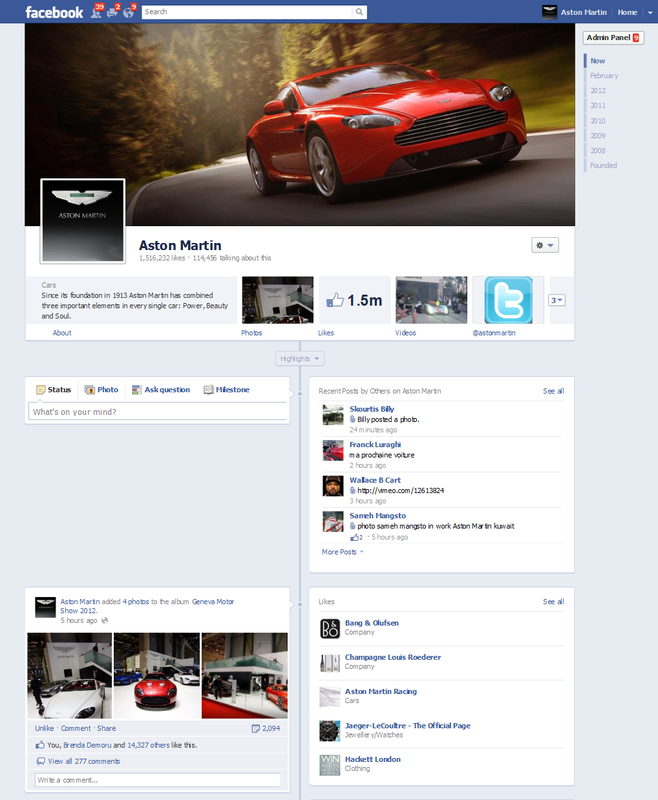 Many brands within the old design allowed users to post on the main wall display (we filtered to Aston Martin posts as a default but full visibility was only a click away) but the new design isolates user wall posts to a much smaller part of page real estate. From a selfish ‘brand presentation’ perspective this helps deliver a clean brand experience, whether that be imagery, video or status updates, but it got me thinking about whether and how facebook brand timelines differ from a brand / product blog. The differentiatoin of brands building up a presence on facebook – and the attraction for fans – was that the brand was ‘laid bare’ to the public for it to interact with, bringing great benefits but also great responsibility for brands. By reducing facebook brand pages to a more sanitised area then in short aren’t we left with a group of glorified blogs which happen to exist within a highly active social space? Clearly the benefit to facebook is to reduce the visibility of spam and also to encourage brands to invest more heavily on advertising a cleaner and more controlled socialised brand presence, but it does grate with me slightly that one of the key and original elements of a facebook brand page is now more or less optional.